During commencement 2011 we evaluated a number of new hardware and software solutions to improve our digital video workflows, in addition to improvements in our live and on demand video streaming services. The testing noted below was related to the Viewcast Niagara 2120 encoder. Digital Video Pilot – Evaluation of hardware encoder for live streaming Notre Dame Commencement. 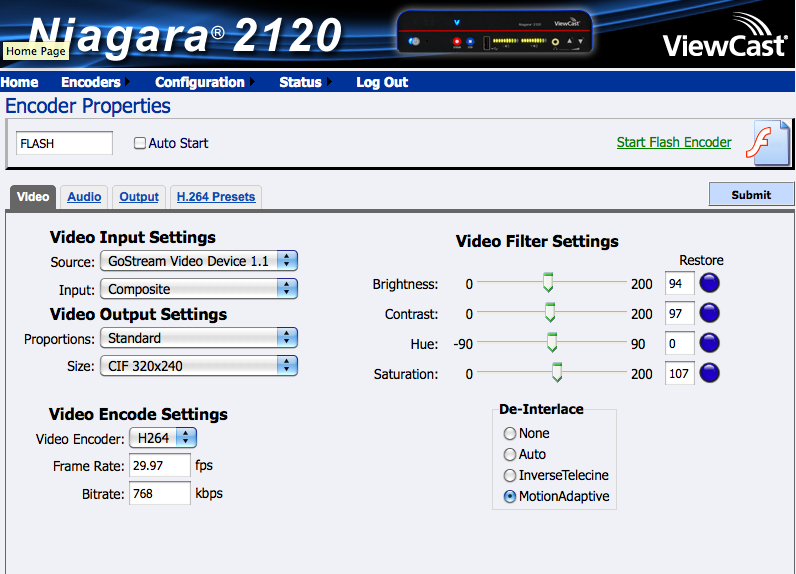 Using a Viewcast Niagara 2120 hardware encoder to encode video and deliver to streaming server or service. Testing the Viewcast Niagara 2120 was a late addition to the evaluation process, but can be compared directly to the testing of the Telestream Wirecast Pro encoding software. The original idea was to encode the video and send the digitized stream to UStream for live delivery. Ultimately, the decision was made to use the Wowza server to deliver and evaluate quality and ease of use of the Viewcast Niagara 2120 encoder. Quality improvements over existing OIT encoder – The use of the H.264 codec will likely improve the quality of live streaming of campus events, including but not limited to weekly Mass from the Basilica of the Sacred Heart. This could be used as a direct replacement to our existing Windows Media encoding server. Usability – The Viewcast Niagara 2120 can be configured for “one-touch” live streaming at the push of a button on the front of the encoder. This would reduce the complexity involved and eliminate the need for the existing Windows encoder in our department. The Viewcast Niagara 2120 also has an accessible web interface for easy configuration and usage. Though I have to say the GUI needs work, looks/feels dated and a bit clumsy. During commencement weekend, it was discovered there was a problem with ElectroMagnetic Interference (EMI) introduced to the encoder. This has since been resolved in additional testing. Using the Viewcast Niagara 2120 encoder along with the Wowza server, provided the capability of delivering the live video to the following playout formats: Adobe Flash, Windows Silverlight, Apple QuickTime, and Apple iOS for iPhone, iPad, iTouch devices. The results were mixed and will require further research and evaluation; initially here are the results on a Macintosh computer. The video plays using Flash, Silverlight, QuickTime and iOS. The best quality came from the Silverlight delivery, with Flash video next best (some macroblocking noticed on screen refresh). Additionally, the playout using QuickTime or delivery to iOS devices produced stuttered video, very shaky and unusable. Since the results were mixed and there was insufficient time to evaluate, more time is needed to effectively test this solution as part of the digital video workflow. Update – in working with Viewcast engineering support, this stuttered video seems to be something new, but there’s hope this can be fixed with a software upgrade to the encoder. There are rumors that the sync issues could be a bug or problem with AAC audio encoding. Finally, testing with the encoder to UStream was eventually conducted after our commencement events. This worked fine to both UStream and the embedded code on a website. However, watching the video on an iPAD with the UStream application, the stuttered video was still a problem. So this eliminates the Wowza server as inducing any sync issues, as the same problem occurred with UStream. There were stuttered video issues noted with the playout of the video on an iPAD – there’s a rumor that this sync issue could be a bug or problem with AAC audio encoding.